Well this is Mama. She writes under this name and she has several books that have cats. But the story in this bundle is Poison Paw, about Chickadee, a feline assassin. Mama says I was kind of an inspiration for this because of how I always ran in front of her feet on the stairs! Sometimes work slips in through the window even after you’re retired. Chickadee, a specially trained silver shaded Persian feline assassin wakes to a soft noise. The scent of a female Siamese reaches her nose. Chickadee’s human, Yvonne slumbers in the bedroom unaware of the danger that has entered her home. Will Chickadee’s reflexes remain fast enough to save Yvonne before the Siamese assassin strikes? 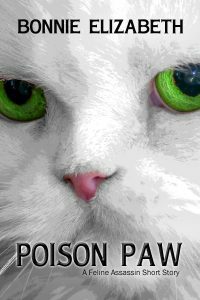 Poison Paw is a short urban fantasy about a pair of unlikely assassins. Fans of Bonnie Elizabeth will no doubt delight in this tale told by a former feline assassin. Mama also has other books with cats. She has Familiar Trouble written from a cat’s point of view and she also has the Whisper series which features Zari A, a cat who is not a cat. I really liked this story. Your mom has a good understanding of cats. WE are very impressed that your mum is a writer. We need to read this! Thank you for your nice words! We very much appreciate them! The mom has read a couple of the books in the Whisper series and has enjoyed them. I hope Chickadee was able to save her human from the Siamese assassin! Feline Assassin. I love it. It’s nice to see you all but no fighting please! Dang, the Mom has been busy!